Mark James Williams, MBE (born 21 March 1975) is a Welsh professional snooker player who is a three-time World Champion, winning in 2000, 2003, and 2018. As the current World Champion, he is due to defend his title at the 2019 World Snooker Championship in April/May 2019. Aged 43 when he triumphed in May 2018, he became the second oldest winner of the World Championship at the Crucible (Ray Reardon was the oldest winner in 1978, aged 45). Often noted for his single-ball long potting ability, Williams has earned the nickname "The Welsh Potting Machine". Williams has been ranked the world number 1 for a total of three seasons in his career (1999/2000, 2000/2001, and 2002/2003). His most successful season to date was 2002/2003, when he won the acclaimed treble of tournaments (known as the Triple Crown): the UK Championship, the Masters, and the World Championship. In doing so, he became only the third player, after Steve Davis and Stephen Hendry, to win all three Triple Crown events in one season. In addition, he is the first player (and to date, the only player) to win all three versions of the professional World Championship – the World Snooker Championship, the Six-red World Championship and the World Seniors Championship. The first left-handed player to win the World Championship, Williams has won 22 ranking tournaments overall, including two UK Championships (1999 and 2002), making him fifth on the all-time list. He has also won the Masters on two occasions (1998 and 2003). His form began to decline after his second World Championship title in 2003; he then dropped out of the top 16 following the 2007/2008 season, but he regained his place for 2009/2010. Having failed to win a tournament from 2011 until 2017, he proceeded to win three events in 2018, including his third World Championship. Williams has compiled more than 450 century breaks during his career, as well as two maximum breaks in competition. Williams was born in Cwm, near Ebbw Vale, in the Welsh county of Blaenau Gwent. He started playing snooker at an early age and won his first junior event when he was eleven years old; it was then that he realised that he wanted to pursue a career as a snooker player. He scored his first century break when he was thirteen, and had achieved his first 147 break by the time he was eighteen. As a schoolboy, he was also a promising amateur boxer, remaining undefeated in twelve fights. He was encouraged to play snooker by his father Dilwyn, who was a coal miner. At the age of fifteen, Mark did a 12-hour shift down the mines. Williams turned professional in 1992 and finished his first season ranked 119th; three years later, he was ranked in the world's top 16 for the 1996/1997 season. His first ranking tournament win came in January 1996, when he won the 1996 Welsh Open title, beating John Parrott 9–3 in the final. After failing to qualify for the 1996 World Championship, he won the first ranking event of the new season in October 1996, the Grand Prix, beating surprise finalist Euan Henderson 9–5. In April 1997, he went on to win the British Open, beating Stephen Hendry 9–2 in the final. He also beat Hendry in a "thrilling" final in February 1998, to take his first Masters title, winning 10–9 in a black-ball finish in the deciding frame, after recovering from 6–9 down. At the 1997 World Championship, he was drawn against his coach Terry Griffiths, who was making his last appearance at the Crucible as a player; Williams eventually beat Griffiths 10–9 on the black, but then lost 8–13 to Hendry in the last 16. He reached the semi-finals of the 1998 World Championship, losing 14–17 to Ken Doherty. The following year, at the 1999 World Championship, he made it through to the final and finished the tournament as runner-up to Hendry. The 1999/2000 season was a very successful one for Williams who won the UK Championship and the World Championship. These results, along with another ranking title and three runner-up positions, allowed him to capture the world number 1 position for the first time. In the World Championship final he came from 7–13 behind his fellow countryman Matthew Stevens to eventually win 18–16. He also produced a notable comeback in his semi-final match against John Higgins, coming from 10–14 down to win 17–15. Williams won only one ranking event in the following season, the Grand Prix, with a 9–5 victory over Ronnie O'Sullivan in the final, but he was a runner-up in two other ranking events, the UK Championship and the China Open. This was enough to retain his number 1 ranking, although his title defence at the World Championship fell in the second round with a 12–13 defeat to Joe Swail. In the 2001/2002 season Williams also only won one ranking tournament, as he struggled to find the form from the previous season, winning the China Open, where he defeated Anthony Hamilton 9–8 from 5–8 down in the final. However, he lost to the same player 9–13 in the second round of the World Championship and the number 1 ranking to Ronnie O'Sullivan. Another strong performance came in 2002/2003 season when he won the UK Championship, Masters and World Championship titles. This made him only the fourth player after Hendry, Davis and John Higgins to hold these titles simultaneously, and only the third player after Davis and Hendry to have won them all in one season. These results enabled him to reclaim the number 1 spot at the end of the season. In the UK Championship final he beat Ken Doherty 10–9, and in the Masters he beat Hendry 10–4. Before the 2003 World Championship he had a scare with his cue when it was damaged and badly bent on his flight with Ryanair to play in the Irish Masters, but he had it repaired before the tournament. On his way to winning the 2003 World title, he had a relatively untroubled route to the final with wins over Stuart Pettman 10–2, Quinten Hann 13–2, Hendry 13–7 and Stephen Lee 17–8 before facing Doherty in the final. He led 10–2, and looked to be heading for an easy victory, before Doherty fought back to 16–16. Williams regained his composure under intense pressure to win the last two frames and lift the trophy for the second time. The following season, he lost in the first round of the UK Championship to Fergal O'Brien, a match which ended his record run of 48 tournaments in which he had won his first match. His defence at the 2004 World Championship started with a 10–7 win over Dominic Dale, but he lost 11–13 in the second round to Joe Perry, and he endured a run of poor form over the 2004/2005 season, dropping to 9th in the world rankings for 2005/2006. On 20 April, in 2005 he became the first Welshman, and the fifth player in history, to score a maximum break at the Crucible Theatre in the World Championship. This came in the final frame of a 10–1 first round victory over Robert Milkins, but he lost in the second round to Ian McCulloch 12–13, in a high-quality match. On 26 March 2006, Williams won his 16th ranking event (and his first in two and a half years), the China Open in Beijing, beating Higgins 9–8 in the final. This helped him return to the top 8 in the world rankings, after a dramatic fall in the provisional rankings which saw him facing a possible drop out of the top 16. He also showed good form in the 2006 World Championship, beating Anthony Hamilton 10–1 and Mark Selby 13–8 to set up a quarter-final clash with Ronnie O'Sullivan, the first time the two had met at the Crucible. The match was given extra tension considering they had been rivals (although O'Sullivan has since said that the former feud has been replaced by friendship and respect). In a close-fought match, O'Sullivan eventually won 13–11. It was revealed during that tournament that Williams had split with coach Terry Griffiths. The two remained very close friends, but Griffiths would no longer be coaching him. In late 2007, Williams returned to having Griffiths as his coach. On 2 September 2006, Williams won the Pot Black trophy, after compiling a century break (119) in the final against John Higgins. However, Williams had perhaps the worst season of his career in 2006/2007, losing his first match in a string of tournaments (including the World Championship, for the first time ever), but he retained his top 16 place, mainly through the ranking points he had earned the previous season. His first win of the 2007/2008 season came in the Grand Prix with a 4–3 win over Ian McCulloch, but he still failed to qualify for the last 16 of the event and was outside the top 32 on the provisional ranking list. In the UK Championship, he showed a return to some form. He beat Ricky Walden comfortably 9–3 in the last 32, and in the last 16 he faced Mark Allen who led 4–0 and 5–1. However, a cool comeback saw him win the remaining 8 frames to win 9–5. In the quarter-finals, Stephen Maguire was too strong and beat him 9–5. However, reaching the quarter-finals was a sign that Williams may have been returning to form, boosted by the news that Terry Griffiths was coaching him again. However, after a 2–6 first round loss to Ken Doherty in the Masters, Williams revealed he was considering retirement from the game, although only 32 years old, if he dropped out of the top 32 and was forced to play in all the qualifying competitions. But he also claimed at the Welsh Open at Newport that this statement had been blown out of proportion, and that he would remain a professional. He began to show more consistency for the remainder of the season, reaching the last 16 of three ranking events and a run to the quarter-finals of the China Open, but he could not reach his first semi-final for two years, losing 3–5 to Ryan Day. At the World Championship he defeated Mark Davis; however, a 7–13 defeat to Ronnie O'Sullivan in the second round forced him out of the top 16, pushing him into the qualifiers for 2008/2009. In that match he was on the receiving end of a 147 break from O'Sullivan. On 8 July 2008 it was announced that Williams had split from his management company 110 Sport, following O'Sullivan and Stephen Maguire. In 2008/2009 he reached the quarter-finals of the Shanghai Masters and UK Championship, but also suffered three qualifying defeats. The UK Championship particularly saw some return to form as he beat Mark Selby and Graeme Dott 9–7, before losing narrowly 8–9 to Ali Carter. He also qualified for the World Championship but lost 7–10 to Stephen Hendry after leading 7–5. During the end of the match he suffered some trouble with his tip. However, he had done enough to return to the top 16 at the end of the season. The 2009/2010 season started badly when Williams broke his wrist in a fall at home, less than a month before the first ranking event of the season, the Shanghai Masters. Despite this injury he played in Shanghai, wearing a cast on his wrist because its removal could have caused long-term damage. There he won his first round match against Joe Swail 5–3, but lost in the next round against John Higgins 1–5. In the Grand Prix he secured wins over Stuart Bingham, Stephen Hendry and Robert Milkins on his way to the semi-finals but despite racking up a 142 (the highest break of the tournament) in the first frame against Ding Junhui he lost 1–6. In the UK Championship he led Graeme Dott 6–2, before Dott retired due to illness and Williams thus won the match 9–2. After this he lost his next match against Peter Lines 8–9. At the Masters he won his wild card round match, beating Rory McLeod 6–2. Then he won his first round match against Ali Carter 6–3 to progress to the quarter-finals of the event, despite being involved in a traffic accident the day before his match against Carter. It was reported that a car drove into the back of the 4×4 that his sponsors had lent him, which was carrying Williams and Stephen Hendry to a restaurant. In the quarter-finals he defeated Shaun Murphy 6–4, but eventually lost a high-quality match in the semi-finals 5–6 against Ronnie O'Sullivan. In the Welsh Open, he reached the quarter-finals, beating Fergal O'Brien 5–2 and Andrew Higginson 5–0 before losing against Stephen Maguire 1–5. After these signs of form, in April 2010 he won his first ranking tournament in four years – the China Open. On his way he beat Jamie Cope 5–3, the then reigning world champion John Higgins 5–2, Marco Fu 5–1 and Ali Carter 6–4, setting up a clash with Ding Junhui in the final. Trailing 3–5 at one point, Williams eventually won the match 10–6. This was Williams' 17th ranking event win and his 3rd China Open. After his victory Williams said: "I'm over the moon to win again. It's been a long time coming but I've kept working hard and I felt that in the end the results would come." In the World Snooker Championship Williams defeated Marcus Campbell 10–5 in the first round, but lost his second-round match against Ronnie O'Sullivan 10–13. He finished the season ranked 8th. Williams opened the season by winning the first event of the Players Tour Championship by defeating Stephen Maguire 4–0 in the final, a new addition to the snooker calendar introduced by Barry Hearn, a series of events that Williams has supported. Williams finished 6th on the Players Tour Championship Order of Merit. In the Shanghai Masters Williams won his first round match against Ricky Walden 5–3, but lost narrowly in the second round against Graeme Dott 4–5. He then reached the semi-finals of the World Open, where he lost 2–3 against eventual winner Neil Robertson. He was selected to compete in the 2010 Premier League, due to his success from the previous season, the first time he has competed in the event for five years, but failed to reach the semi-finals. At the UK Championship he reached the final, his run including a 9–8 victory over Shaun Murphy after trailing 6–8, but lost against John Higgins 9–10 in the final, after leading 7–2, 8–4 and 9–5 at some points of the match, as well as leading the 17th frame by 29 points with only the colours remaining, meaning Higgins needed a snooker to stay in the match. Williams' next tournament was the Masters, where he lost 4–6 in the first round against Ding Junhui. Williams won the first ranking event of 2011, the German Masters, by defeating Mark Selby 9–7 in the final. At the China Open Williams lost in the first round 4–5 against Stephen Lee, despite making four centuries. At the 2011 World Snooker Championship, Williams defeated Ryan Day 10–5 in the first round, and Jamie Cope 13–4 in the second round. He then won his quarter-final against Mark Allen by the same scoreline, and in doing so he reached the semi-final stage for the first time since 2003, but lost 14–17 against John Higgins. As a result of Selby's exit from the tournament Williams became the new world number one after the event. At the World Cup Williams was partnered with Matthew Stevens to represent Wales, and they reached the semi-finals, losing 1–4 against China. Williams then reached the final of the Australian Goldfields Open, but lost 8–9 against Stuart Bingham, after leading 8–5 at one point of the match. Williams also lost from a winning position in the final of the next major ranking event, the Shanghai Masters. His run included a 6–5 win over Neil Robertson in the semi-final, and he led Mark Selby 9–7 in the final, but lost the last three frames to lose 9–10. The defeat also meant that Selby took the world number one spot from Williams. He was beaten in the last 16 of the UK Championship by Ricky Walden and reached the quarter-finals in his defence of the German Masters, where he succumbed 3–5 to Stephen Lee. Williams suffered a 1–5 defeat to Mark King in the first round of the World Open and by the same scoreline to Ronnie O'Sullivan in the second round of the China Open. Williams played in 11 of the 12 PTC events throughout the season, but could only reach the last 32 two times, in Event 10 and Event 11. He was ranked 82nd in the PTC Order of Merit, comfortably outside the top 24 who made the Finals. Williams caused a degree of controversy ahead of the World Championship by stating on his Twitter page that he "hates" the tournament's venue, the Crucible Theatre, and hopes it will be played in China soon. He also swore when describing the Grade II listed building. A spokesman from the WPBSA confirmed a statement would be released regarding the matter. Williams was drawn to play Liu Chuang in the first round and won 10–6 to set up a second round clash with O'Sullivan which he lost 6–13. The result meant that Williams has failed to beat O'Sullivan in over 10 years in ranking events. Williams ended the season ranked world number 3. It was revealed by World Snooker that Williams had been fined a total of £4,000 for his comments made before the World Championship. Williams first ranking event of the 2012/2013 season was the Wuxi Classic, where he beat Tom Ford and Mark Allen, before losing 3–5 to Marcus Campbell in the quarter-finals. He went one better at the Shanghai Masters by seeing off Mark Davis, Ricky Walden and Joe Perry to face Judd Trump in the semi-finals. Trump was 5–1 up and on a break of 53 for the match, but Williams came back to trail 4–5 before losing the next frame to come up short of completing a comeback. Williams then suffered a huge dip in form as he lost in the first round of six successive ranking events; after his defeat to Mark King in the UK Championship he suggested that he was contemplating retirement. During his string of defeats he did beat Matthew Stevens in the non-ranking Masters from 1–4 down (Stevens also missed a pot for 5–1), but then lost 1–6 to eventual champion Mark Selby. At the China Open in March Williams won his first match in a ranking event since September with a 5–2 victory against Lü Haotian and continued his run by defeating Ali Carter 5–4, before losing 1–5 to Selby in the quarter-finals. At the World Championship he lost 6–10 to debuting compatriot Michael White in the first round and admitted afterwards that the season had been one he would be looking forward to forgetting, but he was committed to playing next year. His poor season saw him drop 12 places in the rankings to world number 15. In July 2013 he won the Rotterdam Open, defeating Mark Selby 4–3 in the final. This was Williams' second title in a Players Tour Championship event. However, he had a poor season in the ranking events as he failed to reach a single quarter-final for the first time since the 2006/2007 season. He did earn an encouraging 4–3 win over world number one Neil Robertson at the Welsh Open; Williams said afterwards that he was glad he had ignored his friend Stephen Hendry's advice to retire and believed he still had ranking event titles left in him. He had chances to move 3–0 ahead in the last 16 against Marco Fu, but eventually lost 2–4; afterwards he said that the Williams who won two world titles over 10 years ago was "dead". In the qualifying rounds for the World Championship, Williams lost 8–10 to Alan McManus, meaning he was absent from the tournament for the first time since 1996. Williams finished the campaign as the world number 18, the first time he had ended the season outside of the top 16 in six years. Williams lost in the second round of his first two ranking events of the 2014/2015 season. His first quarter-final of the campaign was at the International Championship and he trailed Ronnie O'Sullivan 0–3, before winning five successive frames with a high break of 120. The match went into a deciding frame, which Williams won to beat the five-time world champion for the first time in 12 years. His semi-final match against Mark Allen also went all the way, after Williams had been 4–7 down, and a miss on the final red proved crucial as he was defeated 8–9. He was beaten 2–6 by Stephen Maguire in the third round of the UK Championship. After knocking out Judd Trump 4–1 to reach the quarter-finals of the Welsh Open, Williams said that he no was longer expecting to win tournaments and was more concerned with improving his ranking. He then made two centuries in defeating Marco Fu 5–1 to play in the semi-finals of the event for the first time since 2003. Williams took advantage of Ben Woollaston missing chances to send their match into a deciding frame after he had been 3–5 behind, but lost it to just fall short of reaching the final in his home tournament. Williams won through to the final of the minor-ranking Gdynia Open, but was whitewashed 4–0 by Neil Robertson. 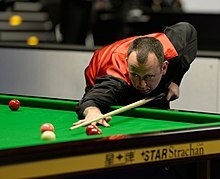 Despite only being 39 years old, Williams took part in the World Seniors Championship as he would turn 40 before the end of the season and he won the title by beating Fergal O'Brien 2–1. Another ranking event semi-final followed at the Indian Open, where he lost 2–4 to Michael White. After defeating Thepchaiya Un-Nooh in the first round of the Players Championship Grand Final, Williams produced back-to-back comebacks from 1–3 down to knock out both Mark Selby and Matthew Selt 4–3. He then reached his first major ranking event final in over three years with a 4–2 win over Judd Trump and raced into a 3–0 lead against Joe Perry. However, his highest break in the next four frames was 14 as Perry fought back to triumph 4–3. In a rematch of the 2000 final, Williams played Matthew Stevens in the first round of the World Championship and was thrashed 10–2. Williams lost 1–5 to Judd Trump in the quarter-finals of the Shanghai Masters. He reached the final of the non-ranking General Cup, where he was defeated 3–7 by Marco Fu. He drew Ronnie O'Sullivan in the first round of the Masters and was 4–2 ahead. However, the match went to a deciding frame in which Williams missed a risky plant and lost 5–6. He lost in the fourth round of the Welsh Open 2–4 to Mark Selby and in the first round of three other ranking events and in qualifying for the China Open. Williams saw off Graeme Dott 10–4 and Michael Holt 13–8 to reach the quarter-finals of the World Championship for the first time in five years. However, he was then thrashed 3–13 by Ding Junhui in the quarter-final, with a session to spare. Williams won a trio of frames to force a decider in the semi-finals of the Riga Masters against Michael Holt, but missed the final brown to be defeated. He reached the quarter-finals of the Northern Ireland Open by beating John Higgins 4–1, then lost 4–5 to Kyren Wilson. He recorded another quarter-final at the UK Championship, but was downed 2–6 by Ronnie O'Sullivan. In the third round of the China Open, Williams came from 1–4 down to eliminate Higgins 5–4 and then thrashed Shaun Murphy 5–1. Another comfortable win followed as he saw off Hossein Vafaei 6–1 to play Mark Selby in the final. Williams needed to win to break back into the top 16 and avoid having to qualify for the World Championship. He was 8–7 up, but lost the last three frames to be beaten 8–10, falling short of winning his first ranking event for six years. He made it through to the final World Championship qualifying round, before Stuart Carrington beat him 10–7. Williams was noticeably absent from the cast of players at the Crucible's 40th anniversary, O'Sullivan suggesting that he was bitter about not qualifying for the championship. Williams won his first ranking title after a six-year drought, the Northern Ireland Open, defeating Chinese rising star Yan Bingtao 9–8 in the final; the victory was emotional for Williams, as he revealed that his wife had been suffering from ill health, and he had considered withdrawing from several tournaments. In the Masters, he faced Mark Selby in the first round, recovering from 3–5 behind to defeat the incumbent World Champion 6–5. He lost 1–6 to Kyren Wilson in the quarter-finals. Having beaten Oliver Lines 5–1 and Matthew Stevens 5–3 to qualify for the 2018 German Masters, Williams lost the first two frames of his first-round match against Fergal O'Brien but went on to beat O'Brien 5–3, later overcoming Matthew Selt 5–2 and Jimmy Robertson 5–3 to reach the semi-finals. There, he recorded breaks of 109, 68 and 51 in defeating Judd Trump 6–1 to reach the final, where he would face Graeme Dott. In the final, Williams was dominant, making six breaks over 50 and one century, a 110 in the eighth frame. Dott won the third frame to trail 1–2, compiling a break of 64 after an earlier 56 by Williams, but did not win another, as Williams ran out a 9–1 victor. Williams advanced to the semi-finals of the World Championship fairly comfortably, and before his match with Barry Hawkins in the semi-final said that he would do his press conference naked as the world champion if he won. Hawkins would prove to be Williams' most difficult opponent of the tournament: Williams levelled the match at 15–15 and secured the lengthy, hard-fought frames needed to win at the eleventh hour. Williams reached his first World Championship final since 2003 facing his fellow 'Class of '92' member, John Higgins. The match was described as one of the best finals in the history of the tournament, Williams winning 18–16 to claim his third World Championship making him aged 43 the oldest winner since Reardon who was 45 in 1978, it also marked 15 years since his last title making it the largest time span between titles. Following victory, Williams thanked his late sponsor Ron Skinner, who had died two months earlier, his wife for convincing him not to retire, and coach Stephen Feeney for turning his game around so dramatically from a year ago. As promised, Williams appeared naked at his later press conference, much to the amusement of some news copywriters, but was instructed to wear a towel. As World Champion, Williams would also win the second event of the season, the 2018 World Open, having come from behind in his quarter final against Jack Lisowski (from 0–3 down to win 5–3), Noppon Saengkham in the semi-final (from 2–5 down to win 6–5), and in the final against Dave Gilbert (from 5–9 down to win 10–9). Williams is believed by some snooker pundits to be one of the greatest long potters in the game. He has compiled over 450 competitive centuries during his career, and is 10th on the all-time list of century makers; this is despite his tendency to play exhibition shots, or to miss on purpose, when he knows that the frame is won. He is also well known for his ability to win "scrappy" frames, using his tactical play and by picking out "shots to nothing". An unusual aspect of his playing style is a tendency to position his cue directly underneath his body instead of using the rest, a technique that he often brings into play once a frame is secure. He is partially colour blind and has difficulty distinguishing between the red and brown balls; on one occasion, he potted a brown ball believing it to be red. During the course of his career, Williams has earned the nicknames "Sprog", the "Welsh Potting Machine", and "The Welsh Wonder". Williams is also a keen poker player. He is proud of his Welsh heritage, and has a tattoo depicting the Welsh Dragon eating the English flag. Williams is a keen Manchester United supporter. Williams and his wife Joanne have three sons: Connor (born April 2004), Kian (born 2007) and Joel (born 2013). Williams is good friends with Matthew Stevens and Stephen Hendry, as well as boxer Joe Calzaghe. Williams was awarded an MBE in June 2004. NH / Not Held event was not held. NR / Non-Ranking Event event is/was no longer a ranking event. R / Ranking Event event is/was a ranking event. ^ "Official 147s – World Snooker". Retrieved 8 May 2018. ^ a b c d "Official player profile of Mark Williams (snooker player)". worldsnooker.com. World Professional Billiards and Snooker Association. "Tour Players" section. ^ Welton, Blake (4 March 2015). "Who are the Welsh players set to compete at the Snooker World Grand Prix?". Daily Post. Retrieved 28 December 2016. ^ a b "Mark Williams' snooker tips". BBC Sport. 13 December 2005. Retrieved 29 February 2008. ^ a b "Snooker: 'I'd rather be in the bingo hall than in the players' lounge'". The Independent. 1 February 2004. Archived from the original on 20 February 2009. Retrieved 29 February 2008. ^ "Williams captures Welsh title". The Independent. 4 February 1996. Retrieved 7 May 2012. ^ "Update; Euan's not so Grand". The Free Library. 28 October 1996. Retrieved 7 May 2012. ^ "Snooker: Williams draws strength from win". The Independent. 7 April 1997. Retrieved 7 May 2012. ^ "Snooker: Williams wins on respotted black". The Independent. 9 February 1998. Retrieved 7 May 2012. ^ "Inspired Williams stuns Higgins". BBC Sport. 29 April 2000. Retrieved 8 July 2008. ^ "Profile on Sporting Life 2001/2002". Sporting Life. 2002. Archived from the original on 5 June 2011. Retrieved 5 February 2008. ^ a b "Williams wins thrilling final". BBC Sport. 12 October 2003. Retrieved 2 March 2008. ^ Jones, Clive (17 February 2003). "Williams hammers Hendry". BBC Sport. Retrieved 29 February 2008. ^ "Damages claim over bent cue". BBC News. 11 April 2003. Retrieved 2 April 2008. ^ Warren, Dan (5 May 2003). "Williams wins crucible thriller". BBC Sport. Retrieved 30 June 2010. ^ Warren, Dan; Orlovac, Mark (6 May 2003). "Williams aims to stay on top". BBC Sport. Retrieved 5 July 2009. ^ "Profile on WWW Snooker". Retrieved 29 February 2008. ^ "Chris Turner's Snooker Archive – Records". 2008. Archived from the original on 10 February 2013. Retrieved 8 July 2010. ^ "Video – Williams overwhelmed by maximum break". BBC Sport. 20 April 2005. Retrieved 2 May 2007. ^ Rawcliffe, Jonathan (20 April 2005). "Williams hits superb Crucible 147". BBC Sport. Retrieved 28 February 2007. ^ "Williams ends long wait for title". BBC Sport. 26 March 2006. Retrieved 5 March 2008. ^ "O'Sullivan opens Williams feud". BBC Sport. 25 March 2003. Retrieved 4 April 2008. ^ "Ronnie, Williams Love In". Mirror. Retrieved 28 June 2010. ^ "Profile on Sporting Life 2007". Sporting Life. 2007. Archived from the original on 29 June 2011. Retrieved 2 May 2007. ^ "Williams claims Pot Black prize". BBC Sport. 2 September 2006. Retrieved 30 April 2007. ^ Chowdhury, Saj (15 January 2008). "Williams contemplates retirement". BBC Sport. Retrieved 17 January 2008. ^ "O'Sullivan 147 sees off Williams". BBC Sport. 28 April 2008. Retrieved 15 August 2008. ^ Gary Baker (2008). "Snooker – Williams leaves 110 Sport in bitter split". Wales and West News and Sport. Archived from the original on 25 July 2011. Retrieved 17 August 2008. ^ "Hendry & Selby sent crashing out". BBC Sport. 14 December 2008. Retrieved 5 July 2009. ^ "Carter squeezes through to semis". BBC Sport. 18 December 2009. Retrieved 5 July 2009. ^ "Hendry stuns Williams". BBC Sport. 19 April 2009. Retrieved 5 July 2009. ^ "Unlucky break for Welsh snooker star Williams". The Free Library; South Wales Echo. Farlex Inc.; Trinity Mirror. 14 August 2009. Retrieved 19 April 2010. ^ "Williams Confirmed For Shanghai". Snooker Scene Blog. 1 September 2009. Retrieved 12 September 2009. ^ "Robertson and Ding set for final". BBC Sport. 10 October 2009. Retrieved 31 October 2009. ^ "Williams Snookered By Snow". Global Snooker. Cuefactor Limited. Archived from the original on 27 March 2010. Retrieved 4 July 2010. ^ "Williams and Hendry Hurt in Crash". Global Snooker. Cuefactor Limited. 12 January 2010. Archived from the original on 15 January 2010. Retrieved 13 January 2010. ^ "O'Sullivan edges Williams in Wembley Masters thriller". BBC Sport. 16 January 2010. Retrieved 8 July 2010. ^ Everton, Clive (4 April 2010). "Mark Williams beats Ding Junhui to win snooker's China Open". The Guardian. London. Retrieved 8 July 2010. ^ "Mark Williams beats Ding Junhui to win China Open title". BBC Sport. 4 April 2010. Retrieved 8 April 2010. ^ "Mark Williams backs Barry Hearn to rule World Snooker". BBC Sport. 14 April 2010. Retrieved 28 June 2010. ^ "Mark Williams welcomes Barry Hearn as new chairman". BBC Sport. 22 January 2010. Retrieved 28 June 2010. ^ "Williams takes PTC opener". Sky Sports. 28 June 2010. Archived from the original on 7 July 2010. Retrieved 30 June 2010. ^ "Players Tour Championship 2010 Order of Merit" (PDF). WPBSA. 22 November 2010. Archived from the original (PDF) on 14 December 2010. ^ "Main Event (Draw)". World Professional Billiards and Snooker Association. Retrieved 17 August 2010. ^ "World Open Drawsheet". World Professional Billiards and Snooker Association. Archived from the original on 8 September 2010. Retrieved 18 September 2010. ^ Michael Emons (2010). "Williams: I never expected Premier League return". Premier League Snooker. Archived from the original on 6 October 2011. Retrieved 16 September 2010. ^ "2010 PartyCasino.com Premier League Snooker Results". Premier League Snooker. Archived from the original on 17 October 2012. Retrieved 18 November 2010. ^ Ashenden, Mark (11 December 2010). "Mark Williams beats Shaun Murphy to make UK final". BBC Sport. Retrieved 24 December 2010. ^ "12BET.com UK Championship". WWW Snooker. Retrieved 23 November 2010. ^ "The Masters". WWW Snooker. Retrieved 17 December 2010. ^ "German Masters". WWW Snooker. Retrieved 24 January 2011. ^ "Williams fends off Selby to claim Berlin crown". ESPN. 6 February 2011. Retrieved 7 February 2011. ^ "China Open (2011)". WWW Snooker. Retrieved 23 February 2011. ^ a b "World Championship scores and schedule". BBC Sport. 22 April 2011. Retrieved 28 April 2011. ^ "Mark Williams aims to calm Crucible expectations". BBC Sport. 27 April 2011. Retrieved 28 April 2011. ^ "Chinese Cracker into Semis". World Professional Billiards and Snooker Association. Archived from the original on 29 April 2011. Retrieved 27 April 2011. ^ "PTT-EGAT World Cup (2011) Results". World Professional Billiards and Snooker Association. Archived from the original on 1 August 2012. Retrieved 11 July 2011. ^ a b "Australian Goldfields Open (2011)". WWW Snooker. Retrieved 21 June 2011. ^ "Mark Selby beats Mark Williams to win Shanghai Masters". BBC Sport. 11 September 2011. Retrieved 11 September 2011. ^ "German Masters results". Eurosport. 6 February 2012. Retrieved 20 April 2012. ^ "Mark J Williams 2011/2012". WWW Snooker. Retrieved 20 April 2012. ^ "Order of Merit". WWW Snooker. 8 January 2012. Retrieved 20 April 2012. ^ "World Snooker Championship 2012: Williams 'hates' Crucible". BBC Sport. 20 April 2012. Retrieved 20 April 2012. ^ "O'Sullivan wraps up win over Williams". Eurosport. 1 May 2012. Retrieved 4 May 2012. ^ "WPBSA Statement – Mark Williams". World Snooker. Archived from the original on 4 June 2012. Retrieved 1 June 2012. ^ a b c d "Mark J Williams 2012/2013". Snooker.org. Retrieved 26 April 2013. ^ "Trump holds off Williams to set up final against Higgins in Shanghai Masters". Daily Mail. London. 22 September 2012. Retrieved 26 April 2013. ^ "UK Snooker Championship 2012: Mark Williams threatens to quit". BBC Sport. Retrieved 26 April 2013. ^ "Wonderful White Shocks Williams". World Snooker. Archived from the original on 24 April 2013. Retrieved 26 April 2013. ^ "Official World Snooker Ranking List for the 2013/2014 Season" (PDF). World Snooker. Archived from the original (PDF) on 11 June 2013. Retrieved 28 May 2013. ^ a b "Williams Ends Title Drought in Rotterdam". worldsnooker.com. World Professional Billiards and Snooker Association. 21 July 2013. Retrieved 22 July 2013. ^ "Liu Chuang 2013/2014". Snooker.org. Retrieved 16 April 2014. ^ "Mark Williams glad he ignored Stephen Hendry's advice to retire after beating world No.1 Neil Robertson". Daily Mirror. Retrieved 5 May 2014. ^ "Mark Williams crashes out of Welsh Open snooker". South Wales Argus. Retrieved 5 May 2014. ^ Penman, Andrew (15 April 2014). "Mark Williams misses out on World Championship". South Wales Argus. Retrieved 24 April 2014. ^ "World Snooker Rankings After the 2014 World Championship" (PDF). World Snooker. Archived from the original (PDF) on 8 May 2014. Retrieved 9 May 2014. ^ a b c "Mark Williams 2014/2015". Snooker.org. Retrieved 1 November 2014. ^ "Williams Ends O'Sullivan Hoodoo". World Snooker. Retrieved 1 November 2014. ^ "Allen Beats Williams in Thriller". World Snooker. Retrieved 1 November 2014. ^ "Welsh snooker star Mark Williams knocked out of UK Championships". Wales Online. Retrieved 2 March 2015. ^ "Mark Williams seals quarter-final spot in Cardiff". Campaign Series. Retrieved 2 March 2015. ^ "Welsh Open: Mark Williams and John Higgins through to last four". BBC Sport. Retrieved 2 March 2015. ^ "Woollaston Shocks Williams To Reach Final". World Snooker. Retrieved 2 March 2015. ^ "Robertson Takes Gdynia Glory". World Snooker. Archived from the original on 3 March 2015. Retrieved 2 March 2015. ^ "Mark Williams wins the World Seniors Championship". Sky Sports. Retrieved 29 March 2015. ^ "Perry Wins Maiden Title". World Snooker. Retrieved 29 March 2015. ^ "Mark Williams 3–4 Joe Perry". Love Snooker. Archived from the original on 30 March 2015. Retrieved 29 March 2015. ^ "Matthew Stevens sets up O'Sullivan clash after trouncing Mark Williams 10–2". South Wales Evening Post. 22 April 2015. Archived from the original on 12 July 2015. Retrieved 6 May 2015. ^ "Stuart Bingham's narrow win in Shanghai sets up semi with Judd Trump". Sky Sports. Retrieved 6 August 2016. ^ a b c "Mark Williams 2015/2016". Snooker.org. Retrieved 6 August 2016. ^ "Masters: Ronnie O'Sullivan beats Mark Williams in first round". BBC Sport. Retrieved 6 August 2016. ^ "Snooker World Championship: Ding Junhui beats Mark Williams". BBC Sport. Retrieved 6 August 2016. ^ "Robertson Rules in Riga". World Snooker. Retrieved 13 April 2017. ^ "Kyren Wilson Through to Semi-finals of Northern Ireland Open". The Belfast Telegraph. Retrieved 13 April 2017. ^ "Mark J Williams 2016/2017". Snooker.org. Retrieved 16 April 2017. ^ "Judd Trump makes maximum break en route to China Open quarter-finals". BT Sport. Retrieved 13 April 2017. ^ "Selby King in Beijing". World Snooker. Retrieved 13 April 2017. ^ "O'Brien Wins Record Two-Hour Frame". World Snooker. Retrieved 13 April 2017. ^ "Masters: Mark Selby loses to Mark Williams in first round at Alexandra Palace". BBC. 8 May 2018. Retrieved 8 May 2018. ^ "Mark Williams beats Graeme Dott to win German Masters". BBC. 4 February 2018. Retrieved 8 May 2018. ^ "How Williams won 'one of the greatest finals'". BBC. 2 April 2018. Retrieved 8 May 2018. ^ MacInnes, Paul (8 May 2018). "Mark Williams shows youngsters naked truth about snooker's veterans". The Guardian. Retrieved 8 May 2018. ^ "Williams Fight Back Floors Lisowski - World Snooker". World Snooker. Retrieved 12 August 2018. ^ "Relieved Williams Earns Gilbert Final - World Snooker". World Snooker. Retrieved 12 August 2018. ^ "World Open: Mark Williams wins China title with comeback against David Gilbert". BBC Sport. Retrieved 6 September 2018. ^ "Masters 2004: Player profiles". BBC Sport. 30 January 2004. Retrieved 29 February 2008. ^ "Chris Turner's Snooker Archive – Snooker's Top Century Makers". 2008. Archived from the original on 10 February 2013. Retrieved 6 February 2008. ^ "Billiard Index: Mark Williams MBE player profile". Billiard Index. Archived from the original on 8 July 2008. Retrieved 4 April 2008. ^ "Mark Williams – I want to be world champion again". BBC Sport. 3 December 2009. Retrieved 8 May 2018. ^ Owen, Cathy (8 May 2018). "How much does World Snooker Championship winner earn?". walesonline.co.uk. Media Wales. Retrieved 6 September 2018. ^ "Round-up: Majestic Williams knocks out Carter". Eurosport. 22 September 2010. Retrieved 6 September 2018. ^ "Mark Williams: Hendon Mob Poker Database". The Hendon Mob. 2008. Retrieved 5 March 2008. ^ "Snooker; Williams hopes to be top of the pots". WalesOnline. Media Wales. 11 February 2007. Archived from the original on 18 February 2008. Retrieved 2 May 2007. ^ "Williams Keeps Calzaghe Friendship Outside The Ropes". World Snooker. Retrieved 30 June 2010. ^ "MBE joy for Williams". BBC Sport. 11 June 2004. Retrieved 30 April 2007. ^ a b c Turner, Chris. "Welsh Open". cajt.pwp.blueyonder.co.uk. Chris Turner's Snooker Archive. Archived from the original on 16 February 2012. Retrieved 18 March 2011. ^ a b c d Turner, Chris. "Professional Players Tournament, Grand Prix, LG Cup". cajt.pwp.blueyonder.co.uk. Chris Turner's Snooker Archive. Archived from the original on 16 February 2012. Retrieved 18 March 2011. ^ Turner, Chris. "British Open (including British Gold Cup, Yamaha Organs Trophy and Yamaha International Masters)". cajt.pwp.blueyonder.co.uk. Chris Turner's Snooker Archive. Archived from the original on 16 February 2012. Retrieved 18 March 2011. ^ a b c Turner, Chris. "Major European Tournaments". cajt.pwp.blueyonder.co.uk. Chris Turner's Snooker Archvie. Archived from the original on 16 February 2012. Retrieved 18 March 2011. ^ a b c Turner, Chris. "Thailand Open, Thailand Classic, Thailand Masters". cajt.pwp.blueyonder.co.uk. Chri Turner's Snooker Archive. Archived from the original on 16 February 2012. Retrieved 18 March 2011. ^ a b c Turner, Chris. "World Professional Championship". cajt.pwp.blueyonder.co.uk. Chris Turner's Snooker Archive. Archived from the original on 16 April 2013. Retrieved 18 March 2011. ^ a b c d Turner, Chris. "UK Championship". cajt.pwp.blueyonder.co.uk. Chris Turner's Snooker Archive. Archived from the original on 16 February 2012. Retrieved 18 March 2011. ^ a b Turner, Chris. "Malta Grand Prix, Malta Cup". cajt.pwp.blueyonder.co.uk. Chris Turner's Snooker Archive. Archived from the original on 3 April 2012. Retrieved 27 April 2011. ^ Turner, Chris. "Scottish Open". cajt.pwp.blueyonder.co.uk. Chris Turner's Snooker Archive. Archived from the original on 16 February 2012. Retrieved 11 April 2011. ^ a b c d e Turner, Chris. "Major Snooker Events in China". cajt.pwp.blueyonder.co.uk. Chris Turner's Snooker Archvie. Archived from the original on 16 February 2012. Retrieved 18 March 2011. ^ "Players Championship Grand Final (2015)". Snooker.org. Retrieved 28 March 2015. ^ "Bank of Beijing China Open (2017)". Snooker.org. Retrieved 3 April 2017. ^ "Dafabet Northern Ireland Open (2017)". Snooker.org. Retrieved 27 November 2017. ^ "D88 German Masters (2018)". Snooker.org. Retrieved 5 February 2018. ^ "Betfred World Championship (2018)". Snooker.org. Retrieved 8 May 2018. ^ "HongRuiMa Yushan World Open (2018)". Snooker.org. Retrieved 13 August 2018. ^ Turner, Chris. "PTC". cajt.pwp.blueyonder.co.uk. Chris Turner's Snooker Archvie. Archived from the original on 16 February 2012. Retrieved 11 April 2011. ^ "Kreativ Dental European Tour Event Six (2015)". Snooker.org. Retrieved 1 March 2015. ^ Turner, Chris. "Benson & Hedges Championship, Masters Qualifying Tournament". cajt.pwp.blueyonder.co.uk. Chris Turner's Snooker Archive. Archived from the original on 16 February 2012. Retrieved 11 April 2011. ^ Hayton, Eric (2004). The CueSport Book of Professional Snooker. Suffolk: Rose Villa Publications. pp. Introduction, 166, 167 & 171–186. ISBN 978-0-9548549-0-4. ^ a b c Turner, Chris. "The Masters". cajt.pwp.blueyonder.co.uk. Chris Turner's Snooker Archive. Archived from the original on 7 January 2012. Retrieved 18 March 2011. ^ Turner, Chris. "Pontins Open, Pontins Professional, Pontins World Pro-Am Series". cajt.pwp.blueyonder.co.uk. Chris Turner's Snooker Archive. Archived from the original on 28 February 2012. Retrieved 22 September 2012. ^ a b c Turner, Chris. "Liverpool Victoria Charity Challenge, Champions Sup". cajt.pwp.blueyonder.co.uk. Chris Turner's Snooker Archive. Archived from the original on 13 March 2012. Retrieved 11 April 2011. ^ a b c Turner, Chris. "Premier / Matchroom League". cajt.pwp.blueyonder.co.uk. Chris Turner's Snooker Archvie. Archived from the original on 16 February 2012. Retrieved 18 March 2011. ^ Turner, Chris. "Pot Black, Junior Pot Black". cajt.pwp.blueyonder.co.ukl. Chris Turner's Snooker Archive. Archived from the original on 16 February 2012. Retrieved 18 March 2011. ^ "Finnish Snooker Challenge". top-snooker.com. Top Snooker. Archived from the original on 31 August 2011. Retrieved 27 April 2011. ^ a b Turner, Chris. "Team Events". cajt.pwp.blueyonder.co.uk. Chris Turner's Snooker Archive. Archived from the original on 16 February 2012. Retrieved 18 March 2011. Wikimedia Commons has media related to Mark Williams. "Official player profile of Mark Williams (snooker player)". worldsnooker.com. World Professional Billiards and Snooker Association. "Tour Players" section. This page was last edited on 20 April 2019, at 11:30 (UTC).